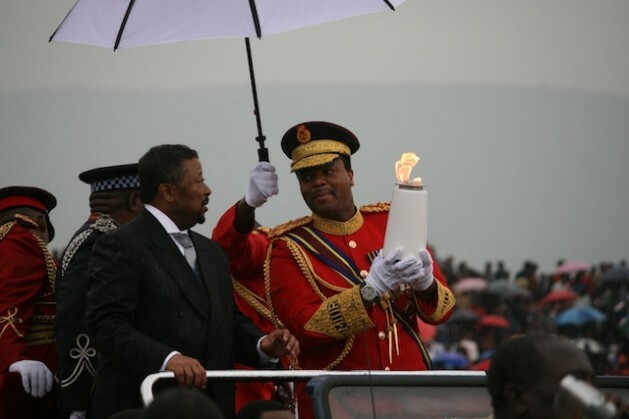 MBABANE, Oct 13 2012 (IPS) - Swaziland’s King Mswati III is under immense pressure following the constitutional crisis that has resulted from his cabinet’s refusal to resign after the House of Assembly passed a vote of no confidence. Political analysts feel this has exposed the undemocratic nature of the Swazi system of government and that it has put Mswati in a precarious position where he has to choose between the will of the people and those he has placed in power. “The prime minister’s actions reveal beyond a doubt that the executive arm of government holds sway and that the verbal or laid-down supremacy of the constitution is not worth the paper that it’s written on,” political analyst Dr. Sikelela Dlamini told IPS, referring to Prime Minister Barnabas Sibusiso Dlamini’s (no relation) refusal to vacate office. The House of Assembly, which is the lower chamber of parliament, fired the cabinet or the executive arm of government, which includes the prime minister and ministers, on Oct. 3 following a ruling by the International Court of Arbitration (ICA) that compelled the state-owned Swaziland Posts and Telecommunications Corporation (SPTC) to shut down all its mobile services after Swazi MTN complained of unfair competition. SPTC has since been left with only its fixed-line business. Mswati holds 10 percent of MTN shares while Prime Minister Dlamini has a stake in Swaziland Empowerment Limited, which own 19 percent of shares in MTN. However, some legal experts have argued that the ICA ruling was not legally binding because it was not an order given by the country’s courts, though the government has insisted that it is bound by it. Prime Minister Dlamini had said a few hours after the vote of no confidence that the cabinet would not step down. “His Majesty’s government believes that the motion passed by the House of Assembly is null and void as it seeks to compel the cabinet to defy court orders,” Dlamini had said, referring to the ICA ruling. While the constitution clearly states that the cabinet should resign three days after a vote of no confidence, government spokesperson Percy Simelane told IPS that the executive branch of the government was still waiting for the King’s decision. On Oct. 9 he told reporters that the prime minister would not step down. Swaziland is a monarchy and Mswati appoints the cabinet and 20 of the 30 senators in the upper chamber of parliament, with the remaining senators appointed by the House of Assembly. And while political parties have not been allowed to campaign for office since 1973, the public can elect members of parliament to the House of Assembly under the Tinkhundla (constituency) system. The vote of no confidence in the cabinet by the House of Assembly has therefore been seen as the vote of the people. Director of the Coordinating Assembly of NGOs Emmanuel Ndlangamandla said that the House of Assembly’s decision reflects the will of the people and Mswati is expected to endorse the resolution if he is serious about upholding the rule of law and democracy. “We can’t have a situation where we have authorities on one end and the people on the other. In this case, it’s clear that the people do not want the government,” said Ndlangamandla. A highly placed source told IPS that the 44-year-old monarch is refusing to see the Speaker of the House about this matter and is not prepared to act on the vote because he was extremely upset by the House of Assembly’s resolution. The constitution gives Mswati powers to dissolve the cabinet after a vote of no confidence. The Speaker of the House of Assembly, Prince Guduza, who happens to be Mswati’s half brother, said he was still seeking an audience with the King on the matter. However, the Law Society of Swaziland said in a statement on Friday, Oct. 12 that the vote of no confidence was legal until the courts declared it otherwise. “It is our view that this matter should have been taken to court as a matter of urgency,” the statement said. Meanwhile, the House of Assembly has resolved to boycott the cabinet, which means that the debating and passing of bills in parliament has stalled. But the law is on the side of the people, said constitutional lawyer Thulani Maseko, who argued that not even Mswati is above the constitution. He added that he was not surprised at the turn of events given the authorities’ disregard for the rule of law and human rights. “The constitution has been undermined, breached and flouted every step of the way in more ways than one,” Maseko told IPS. Federation of Swaziland Business Community president Henry Tum du Pont told IPS that the cost of communication services in Swaziland were the highest in the Southern African Democratic Community because of the mobile phone monopoly and further criticised the prime minister for acting selfishly in this matter. “The SPTC saga is one of a long line of self-serving decisions taken by this cabinet, which seriously undermine the business reputation of the country,” said Du Pont. The showdown between the cabinet and the House of Assembly is strengthening the voice of progressives in their call for multiparty democracy. Since 2008, trade unions have called for a multiparty democracy through labour protests that have been met by a vicious clampdown by security forces. The king refuses to speak to his half-brother, the Speaker of the Assembly, about a constitutional crisis? Swaziland has brought new meaning to the word “reactionary”.